Before George H.W. Bush was laid to rest next to his wife Barbara and daughter Robin at the George H.W. 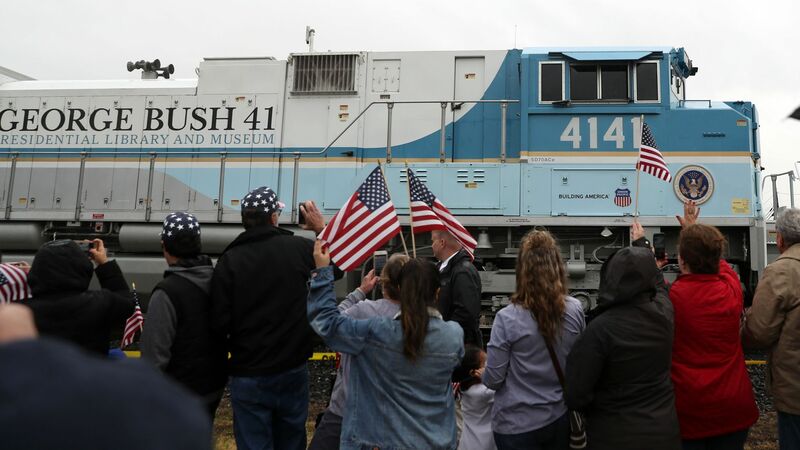 Bush Presidential Library in College Station, Texas, a procession took place from Houston to Texas A&M University's library grounds via presidential funeral train, the first such procession since Dwight Eisenhower, the Associated Press reports. Details: In 2005, the locomotive was unveiled for a special exhibit at the library, and was intended to be used to pull the late president’s funeral train. "The locomotive was painted to resemble Air Force One, but George H.W. Bush joked that if it had been around during his presidency, he may have preferred to ride the rails rather than take to the skies," the AP writes. The funeral train carries President George H.W. Bush's casket to the library in College Station, Texas. Onlookers wave and salute the presidential funeral train as it passes by. Members of the public lining the route to pay their respects can be seen from the carriage carrying the flag-draped casket of former President George H.W. Bush. Family and friends attend a funeral service for George H.W. Bush in Houston. Photo: David J. Phillip-Pool/Getty Images. Jets fly overhead before the internment ceremony of President George H.W. Bush. The 41st president was laid to rest in a private ceremony surrounded by close relatives and friends.